Place the onion, garlic, sugar, smoked and sweet paprika, salt, thyme, malt vinegar, peppercorns and water in a large saucepan over high heat and bring to the boil. Add the ribs, reduce the heat to medium and cover with a lid. Simmer for 30–40 minutes, or until the ribs are tender. While the ribs are cooking, make the smoky barbecue sauce. Place the onion, garlic and tomato in a food processor and process to a coarse purée. Place the tomato mixture, mustard, cayenne pepper, salt, smoked and sweet paprika, sugar, Worcestershire sauce and honey in a medium saucepan over medium heat. Bring to a simmer, reduce the heat to low and cook, stirring occasionally, for 20–25 minutes, or until thickened. Carefully remove the ribs from the cooking liquid and place in a large deep-sided tray or dish. While the ribs are still hot, rub the barbecue sauce evenly over the ribs to coat. Cover with plastic wrap and refrigerate for 30 minutes until cool, or overnight. Preheat oven to 220°C (425°F). Place the ribs on wire racks set over 2 baking trays lined with non-stick baking paper. Roast for 20 minutes, brushing with the marinade every 5 minutes, or until golden and sticky. 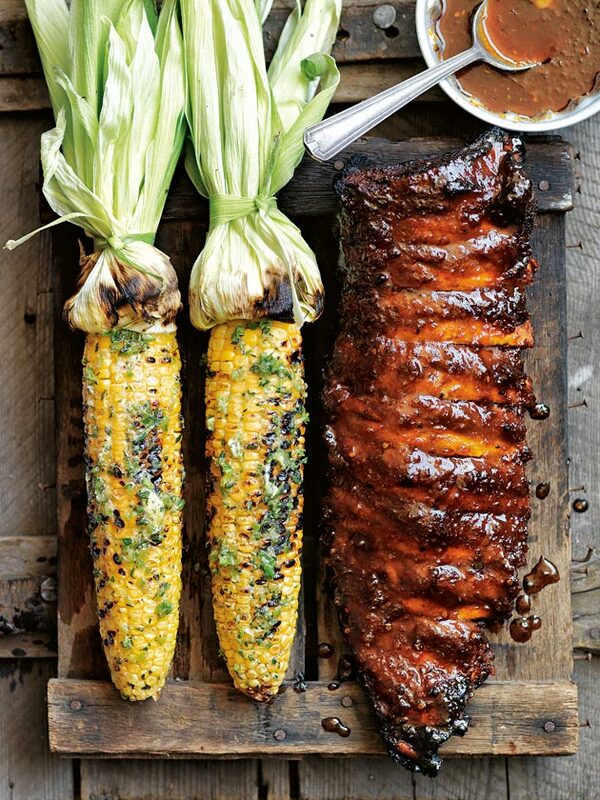 Serve with the grilled corn with lime and chilli butter. Serves 4.